Progress in Afghanistan: Will the U.S. Strategy Succeed? Many apologies for the delayed posts. August is a bit of a lazy month in Washington–especially in terms of the Hill and think tanks. This week, there weren’t too many events to cover, seeing as Obama has been on vacation in Martha’s Vineyard. Next week, we kick things off with some action in the Middle East–Obama is set to start peace talks again b/w Palestine and Israel, and he’s going to make a big speech on the withdrawal of troops from Iraq. I’ll keep my eyes peeled. Brookings held an interesting discussion on success in Afghanistan from the perspective of a former Pakistani general and a State Department official. Also, one of my favorite speakers on foreign policy, Steve Coll, spoke at the widely-attended event. Vali Nasr, a senior adviser to Richard Holbrooke, said that the U.S. has had more success in Pakistan because the interactions have been between the two governments with limited military and civilian interaction. In Afghanistan, the U.S. has been accused of causing high numbers of civilian causalities and not mingling well with the Afghans who either see the troops as saviors or invaders. Gen. Jehangir Karamat (ret.) said that the U.S.’s efforts in Pakistan will have a great impact on its success in Afghanistan. “I really think there’s no real alternative to what the U.S. is doing in Afghanistan,” he said. He said a lot of the negativity towards the U.S. in Pakistan is linked to the public’s ignorance of the intricacies of the relationship. He said the biggest issue to the people of Pakistan in the coming months will be recovery efforts and the rebuilding of their economy. Coll concluded the discussion with a fundamental question he felt would dictate the path of the U.S/Pakistan relationship in the midst of flood relief and potential talks with the Taliban. Iraq has sprung back into the forefront of news recently after Obama announced last week that America’s mission in Iraq will change. Although it was my understanding that the mission “changed” long ago, this speech seemed to steer the debate towards the reality of the pull out. Can American troops withdraw from Iraq, train their forces, create institutional structures and stabilize the government in a year without insurgents taking charge? In a speech at the national convention of the Disabled American Veterans in Atlanta, Obama sounded hopeful about the situation in Iraq, at least compared to conditions in the other countries in the region (Afghanistan, Pakistan and Iran). He said we will begin drawing down combat troops by the end of the month, leaving 50,000 troops behind to train Iraqi security forces and provide security for diplomats. He promised in the speech that all U.S. troops would be gone from Iraq by the end of next year. By September, the White House says there will be 146,000 troops on the ground. Obama said by then, he will have brought home 90,000 troops since he took office (but he didn’t mention the call for 30-some-odd thousand troops he wants in Afghanistan). Obama asserted that violence in Iraq has reached its lowest rates in years, which is a sign that it’s time for U.S. troops to come home. 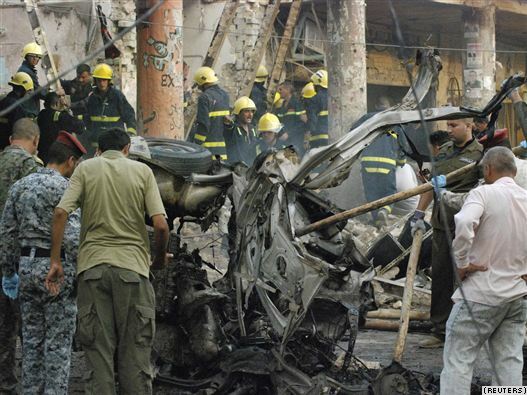 However, new numbers released by the Iraqi ministries of defense, interior and health indicate that Iraqi casualties have reached a two-year high since May 2008. I also follow Arwa Damon on Twitter, who is a CNN correspondent currently in Iraq, and she paints a rather dim picture of human rights and the lack of hope once U.S. troops leave. Robert Tait, a correspondent for RFE/RL wrote an excellent piece the other day on the potential for an insurgent uprising in Iraq because of the weak government and the contradictory casualty numbers. The article said that violent military groups could seek to fill the vacuum created by Iraq’s stalled political process. There’s been a prolonged disagreement between the Iraqi Prime Minister, Nuri al-Maliki and his main competitor, Ivad Allawi, who should form the next government after the March elections. Brigadier General Ralph Baker said the government’s failure accompanied with U.S. pullout could spring a new wave of violence. Baker predicted that insurgent groups would attempt to “discredit the government and discredit the security forces” in an effort to gain a foothold. Brookings here in Washington, D.C. held an online chat with David Mark, a senior editor at POLITICO and Kenneth Pollack of the Saban Center for Middle East Policy about his recent trip to Iraq. I posed questions about the disputed death toll and risks of withdrawing too soon. “It’s certainly possible, but it’s going to be hard—and risky. I am actually pretty comfortable with the drawdown to 50K. I think they can deal with the most likely violence,” he said. He argues that the stability of Iraq in terms of violence will depend heavily on how the elections pan out. The stability of the political process will ensure peace. He says as a fellow at Brookings, he goes to Iraq every 4 to 6 months and has noticed a remarkable change. He also expressed confidence that the Iraqi military could handle any insurgent backlash (more “brutally” even than U.S. forces)or attempts from other groups to come in and invade once the U.S. withdraws. In fact, U.S. troops should be more worried about keeping things cool between different political and ethnic groups inside Iraq rather than enemies outside its borders. “No one knows how the Iraqi military is going to behave once the US military is truly gone–and that is a very big question mark. We have seen militaries that everyone thought were completely professional turn around and overthrow a democratic government within months of the departure of US troops. So we can’t be glib about this problem,” he said. “The problem is that if it goes badly, it absolutely could push the country back to civil war,” he said.